Search Dallas Apartments, Dallas Condos, Dallas Townhomes, Dallas Lofts and Dallas Highrises by property, city, address, school district, or map. Search Dallas Texas Apartments & view property amenities, floor plans, pricing, move-in specials, availability, maps, and resident reviews. Receive up to $500 Cash Rebate for referring our FREE Dallas Apartment Locating service. 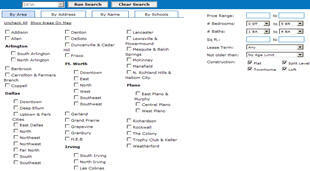 Thanks for visiting our site to locate apartments in Dallas, Texas! We just launched a new mobile friendly site to search Dallas Apartments including flats, apartment lofts, split-level and mid rise and high-rise apartments in Dallas for rent. Search apartments in Dallas, Texas and other popular surrounding urban cities, districts and neighborhoods such as Uptown Dallas Apartments! Welcome to DFW Urban Realty! We offer a professional and personal Dallas rental locating service that is unmatched in the Dallas apartment locating industry. Our Dallas Apartment locators can assist with finding the best deals and rental options on apartments in Dallas Texas as well as unadvertised specials, discounts and incentives. If you're searching for apartment in Dallas and wanting to take advantage of the best Dallas rental cash rebate incentive offered in North Texas, you've come to the right place! Search Our Dallas Apartment Database and view pricing, availability, maps, property amenities, floorplans, move in specials, and resident reviews. Our Dallas apartment locators work hard to provide you with the rent locating service available in the Dallas Fort Worth area. We also pride ourselves on offering the best cash rebate reward on apartments in Dallas for referring our free rental services. We offer a Cash Rebate Reward up to $500.00 for referring our FREE apartment locating service in Dallas, Texas in addition to any specials, discounts and incentives our Dallas apartment locators can find you on community rental properties. Dallas Cash Rebate Guarantee - We guarantee the best Dallas Apartment Cash Rebate reward in North Texas! If you find a better deal, just let us know and we will match the cash rebate incentive and pay you an extra $50.00 when you rent an apartment in Dallas! When you have a minute, please check out our new DFW Urban Realty site that offers a brand new Dallas, TX apartment search to find rentals throughout the DFW Metroplex. Our new site offers multiple options to search apartments, townhomes and condos through Dallas, Fort Worth and surrounding areas.